What’s better than a fat tuna steak just barely grilled on either side? Well, you might say Tuna Crackers or a nice cut of Yellowfin on a sandwich with wasabi mayo. It’s certainly open to debate. Having the best and freshest fish is of upmost importance to us, across all of our restaurants and every type of fish, though tuna is perhaps the most important. It’s a trophy species for recreational anglers but also a main target of the longline boats that fish out of Viking Village and Lighthouse Marina in Barnegat Light. As if September and October aren’t magical enough around Long Beach Island, it’s when we see the most pelagic fish come into the docks of Barnegat Light. “Our local longliners bring in yellow fin, and big eye and Bluefin. Sometimes it’s as much as 25,000 pounds,” says Robbie Robinson of Cassidy’s Fish Market at Viking Village. Robbie is the wholesaler for all of our restaurants. The best fish for our restaurants are usually the 40-60 pounders. Eateries in Philly and New York tend to like the bigger guys. Viking Village is one of only a few commercial fishing docks in the Mid-Atlantic, an outpost that goes back to the first Scandinavian settlers on Long Beach Island. We don’t get all of our fish locally year-round, but when the bite is on, we’re all about it. Among the local longline fleet are the F/V Monica, Frances Ann, Showboat, Eaglet and the Alexandria Dawn. Captains usually go out for 5-14 days at a time. It’s a balance to fill the boat but get the fish back so it’s still the freshest possible. What we call “local” are fish caught out at the Hudson Canyon, 80 miles offshore, which is a lot closer than fishing grounds like the Grand Banks. Dropping down to over 10,000 feet deep, it’s a pool of nutrients fed by the Gulf Stream full of food for tuna. Fish caught in the cooler pockets tend to be of better quality. Longliners put out 25-miles of line with 700 baited hooks, let it set for 6-10 hours, and then haul it in. The fish that are caught are butchered onboard, bled and packed with ice in the hold as soon as possible. The crew will run five “sets” to fill the ice hold before steaming back to the dock. In terms of product, the handling is as important as the catching. When the boat is “packed out” the tuna are loaded onto the dock and graded. 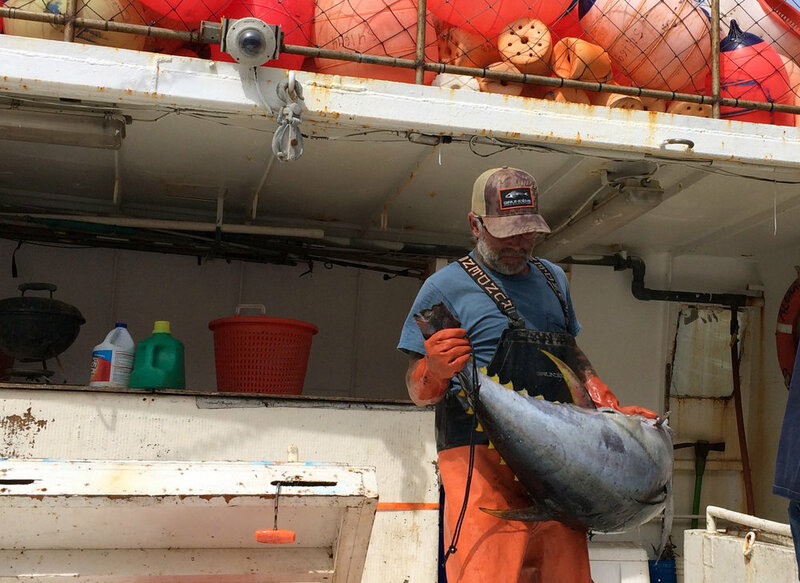 Tuna grading is something of a science and Viking Village’s Chris Sprague is a veteran. He takes core samples and judges the fish based on the hue and fat content. Our Sesame Seared Tuna with sliced avocado, pineapple, soy glaze, over a soba noodle salad has been popular since we opened. Mud City's Grilled Tuna is a longtime favorite, marinated in our house sesame ginger soy. The seared tuna has always been a crowd pleaser at The Black Whale, Mud City and Ship Bottom Shellfish. Beach Haven folks love Rich’s Tuna Spring Rolls at the Whale. We cook tuna to order, but when we have an affinity for rare or raw – sashimi style or poke. Among the most sought after plates this summer on LBI was the Tuna Crackers at Parker’s Garage - raw yellowfin on a Lavash cracker with avocado, sesame and citrus mayo. We discovered Hawaiian poke on our first trips to the Islands. At the Old Causeway, we serve it Hanalei-style over won ton chips. At Shellfish, they can’t seem to make enough of the Poke Nachos over warm tortillas with spicy mayo. You can decide what’s your favorite, but fresh tuna is always a great choice any time you dine at the OC.